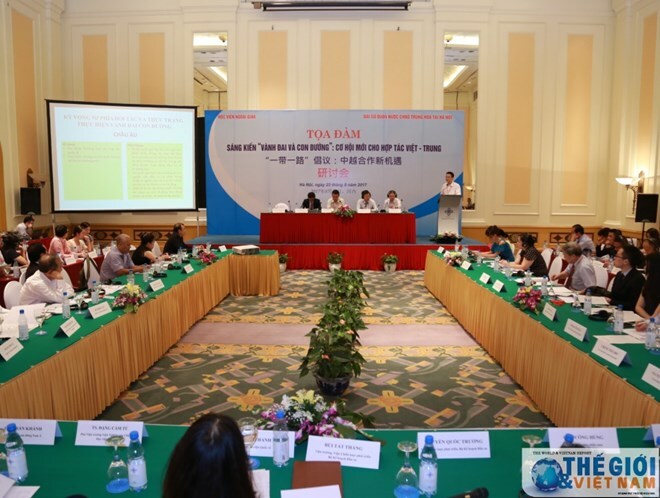 Hanoi (VNA) – A discussion on “Belt and Road Initiative: A new opportunity for Vietnam-China cooperation” took place in Hanoi on August 25, bringing together about 80 delegates from state agencies, research institutes and enterprises of the two countries. The event, held by the Diplomatic Academy of Vietnam and the Embassy of China, is an academic exchange activity between the two sides’ research agencies to discuss the implementation of the Belt and Road Initiative so as to find opportunity for bilateral cooperation. Opening the event, deputy director of the academy Le Hai Binh highlighted the significance of maintaining and fostering peace, cooperation and development in the region. It is important to discuss matters around the initiative in order to give the public, scholars and enterprises in Vietnam a better understanding on its goals as well as opportunities it may bring and others. Bilateral cooperation between the two nations, hereby, can be strengthened towards sustainable development for peace and prosperity in the region, he said. The main objectives of the initiative are to improve the infrastructure in the region and facilitate regional trade, investment and people-to-people exchange, according to Yin Haihong, Charge d’Affaires of the Chinese Embassy in Vietnam. Speaking at the discussion, delegates pointed out advantages and barriers to the countries joining the initiative. The programme will help address global economic issues and bolster sustainable growth through deepening five links on policy, infrastructure, trade and investment, finance and people-to-people exchange. It is also expected to enhance partnership between localities of Vietnam and China and support the two countries in achieving their socio-economic development goals.